The announcement was made by California's Attorney General. It's a complicated mix of potential fixes. Over the next two to nine months, homeowners will be notified by mail as to whether they are eligible for a principal reduction, refinancing or some type of cash payout. Under one scenario, help for homeowners comes from a 12 billion dollar fund to reduce overall principal for some owners. 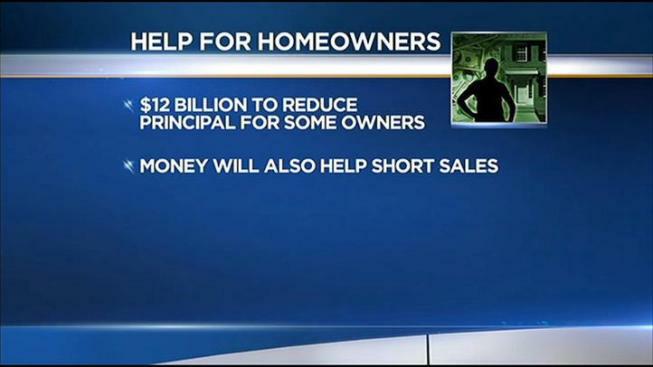 The money will also help short sales for 250,000 homes estimated to be underwater-- or worth less than the loan. That has been fueling the rush of investment purchases in the Inland Empire, otherwise known as bank or real estate owned properties. In Riverside County, 65 percent of all sales are either a short sale or a sale of a bank owned property. Other help for homeowners announced Thursday is focused on people who aren't late. 849 million dollars is set aside to refinance 28,000 owners. They must be current on payments, and their their properties must be underwater. An addition 250,000 people who were foreclosed by the major banks by the end of 2011 are expected to receive payments of 2,000 dollars each.